Writer/director Taylor Sheridan (Sicario, Hell or High Water) likes his symbolism. He both begins and ends his directorial debut, Wind River, with a fair amount of it. The opening of his film, which takes place in Wyoming on the Wind River Indian Reservation sees a literal wolf circling a herd of sheep. Wind River ends with a simple image of two fathers sitting in the background while an empty swing set comes into focus in the foreground, the two empty seats swaying in the light winter wind. How Sheridan's film gets from a rather generic piece of symbolism in the form of a common saying to one that is potentially layered with meaning the viewer can attribute to it due to the journey they've just witnessed is what makes Sheridan's use of this tool so effective. Obviously, Sheridan is a gifted writer who has a knack for building atmosphere and tone and integrating them into the natural environments in which he places his stories, but what had yet to be gleaned was how much of such satisfactory works came from the writer himself and how much was elicited and interpreted from his screenplays via renowned directors like Denis Villeneuve and David Mackenzie. With Wind River, Sheridan lets it be known that he possesses more than capable hands when it comes to bringing his written word to life and, more importantly, conveying the themes and ideas through these visuals that he clearly had an interest in discussing when penning the screenplay. 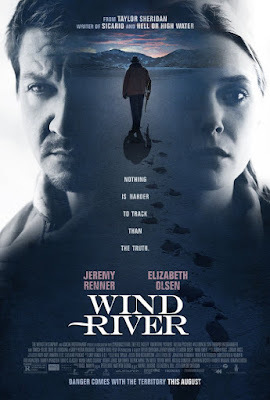 While Wind River doesn't necessarily possess a unique structure or revelatory plot-in fact, it's a rather simple murder/mystery movie-what it does possess is an assuredness of how it confidently wants to tell this story and a clear idea of the aspects of this true story that it wants to highlight so as be both affecting and insightful while still remaining a familiar conceit. The familiarity of the structure and approach is perfectly balanced by that of the desolate-seeming landscape though, which is only emphasized further by the environment no doubt feeling foreign to any viewer that doesn't reside in Wyoming themselves. It's chilling. There are flat fields that seem to go on forever covered in snow with a dead silence that drenches it all which inadvertently seems to inform the locals of the bleakness of their existence. It is in setting a murder/mystery in this already devastated domain that Wind River strikes you; through such aforementioned symbolism that it compels you. 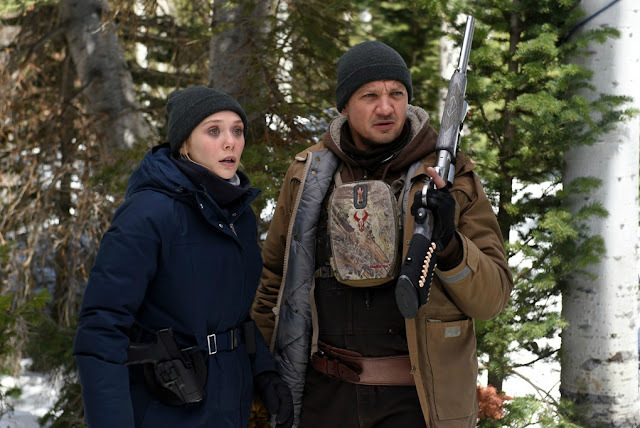 FBI Agent Jane Banner (Elizabeth Olsen) enlists the help of animal tracker Cory Lambert (Jeremy Renner) to help in her investigation. We begin by encountering Cory Lambert (Jeremy Renner) who makes his humble living as a wildlife officer who hunts predators and keeps the nearby neighborhoods and Indian reservation free of any potential threats. Lambert seemingly leads a quiet life as he is now divorced from an ex-wife that wants to pick a fight anytime they start a conversation. His ex-wife, Wilma (Julia Jones), is Native American and as we come to better understand the present dynamic between the two we also learn she and her ex-husband share a son, Casey (Teo Briones), together. Casey and his father take off and travel onto the titular reservation where Wilma's family lives including her father (Apesanahkwat) where Lambert has come to help kill a mountain lion that has been killing their family's livestock. It's evident that Lambert still has a good relationship with his once father-in-law and has seemingly been accepted into the Native American community of Wyoming as his rapport with reservation police chief, Ben (the always welcome Graham Greene), is also one of minimal communication, but perfect understanding. In Lambert's excursion to track down the mountain lion he ends up stumbling upon the body of a teenage woman who has frozen to death. The woman comes to be identified as Natalie (Kelsey Asbille), an eighteen year-old daughter of locals Martin (Hell or High Water's Gil Birmingham) and Annie (Althea Sam). Natalie's body is found in such a remote location and with varying degrees of possible causes of death that there is no clear cut explanation for what happened to cause such circumstances surrounding her death. In light of the death and those questionable circumstances surrounding it the FBI is called in and arrives in the rather unexpected package of Jane Banner (Elizabeth Olsen) who is a rookie agent currently stationed in Las Vegas who just so happened to be the closest one to the crime scene. Banner is very much in over her head and thus is the reason she extends an invite to Renner's Lambert to assist in the investigation as not only was he the one that discovered the body, but also due to his background with hunting predators and his familiarity with the landscape. What Lambert doesn't initially disclose to Banner though, is the fact Natalie's death conjures up memories of his own daughter's tragic passing. Within the first five minutes of the beginning of the film we, as audience members, are already becoming ingrained into the lives of these characters as Sheridan has already tossed out a handful of lines of dialogue that make us feel as if we understand the dynamics and the relationships between these people better than any kind of exposition or visual cues might have. Sheridan's dialogue is direct while still coated in sly, insightful truths. They are remarks that could easily be taken any which way depending on the receiver, but most importantly, they send a message of the mentality of the characters we're supposed to be getting to know. Sheridan accomplishes as much in both an intelligent and efficient manner as Lambert arrives to his ex-wife's house late to pick up their son before leaving for the reservation. Lambert defends himself by stating that it was work that held him up to which Wilma questions who the victim of the day was today with Lambert only remarking that it, "looks like it's gonna be me." That is it and that is all it takes. The entire history of Cory and Wilma's relationship is summarized in this short exchange and Sheridan continues to find ways to phrase exchanges throughout Wind River that accomplish these same things; allowing the viewer to feel as if they know this place and these people and have for years and years which in turn helps the audience to comprehend what these characters feel this place has taken from them-what it has taken from Lambert. There is a theme throughout that deals in the setting of Wind River informing everything that happens in it down to why the characters feel and act the way they do, but this is kind of a given from the get-go. What makes the environment even more integral to the storytelling is that Sheridan approaches it from this standpoint of these people, these Native Americans, feeling resentment towards the land and all the bad that occurs in their lives due to the fact they've been forced out of any other area and into this desolate environment of snow and silence if they desire to carry on the history of their ancestors and tribe at all. To this effect, it is somewhat strange then that the two leads are still a couple of white people-one being a complete outsider with the other essentially serving as an interpreter, but Renner and Olsen make up for this with a chemistry that rides the line of romantic without ever devolving into the obvious, but instead serving as this channel into what have otherwise might have felt not only like an isolated environment, but a foreign culture. Cory attempts to comfort Martin (Gil Birmingham) in the wake of the death of his daughter in Wind River. Moreover, Wind River is about the results of these circumstances-the fact no one knows how many Native American women are missing. That it could be an epidemic that is knowingly being ignored. Sheridan himself has said that his latest film, "explores how much and how little has changed since the American West was settled as well as the consequence of that settlement.” The reservations are designated to be these places of near-impossible conditions where it would be strange if the inhabitants didn't come to some kind of crisis of conscience where they questioned whether their heritage is worth the unavoidably miserable lives they lead and for what appreciation? The younger the generation the less they seem to value as much as not only does Renner marry into a Native American family, but we come to learn Natalie was in a relationship with a man who is a contract worker hired by a security firm to work on the reservation who is also white (Jon Bernthal in a crucial flashback sequence). Sheridan uses the murder/mystery genre and the inherent action, including several gun fights that are surprisingly violent, to get away with slipping in a consciousness. Wind River doesn't meditate or harp on the fact many of these people's issues aren't necessarily self-created, but rather it utilizes a tragic situation and the fact it's not the first of its kind to emphasize a larger point. 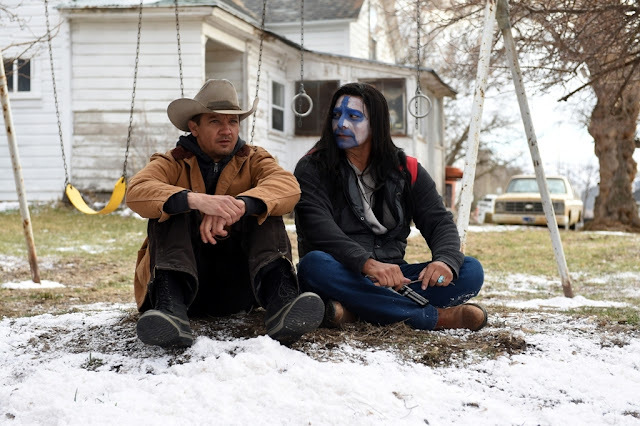 To this extent, Wind River is a success as it leaves one with more than enough to contemplate, but where the film underwhelms is in the experience of being in the midst of it. There are moments, to be sure, but not a single one where the weight of what is being seen and what is being told and the difference as well as the correlation between those two things really hits home. Rather, Wind River hits peaks and valleys in terms of pacing with a single scene featuring Birmingham capturing almost too achingly the grief a parent must feel at the loss of a child. Having to accept that they themselves nor their lives will ever be the same and the fact there is no way to steer from the pain with Renner and Birmingham performing the interaction with understated sincerity. This is all accompanied by a score from Nick Cave and Warren Ellis that is genuinely eerie to which Sheridan uses to strong effect in defining the already otherworldly atmosphere. For the most part though, Sheridan keeps his directorial debut moving with consistently engaging revelations at the heart of the mystery and pulse-pounding action scenes that rely on the unpredictability of human nature. Sheridan utilizes a fair amount of handheld camera work to highlight this natural tone, this human quality in this bare landscape that ultimately results in a satisfying thriller, but more significantly-an ode to the processes of pain and re-building in light of it.